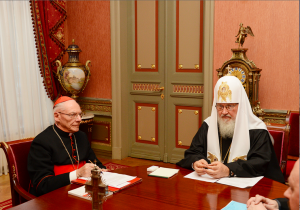 On November 1, 2013, His Holiness Patriarch Kirill of Moscow and All Russia met with Cardinal Paul Poupard, honorary president of the Pontifical Council for Culture, at the patriarchal residence in Chisty Pereulok. The guest was accompanied by lawyer Giuseppe Muzymeci, president of the Cardinal Paul Poupard Foundation, Mr. Fernando Pelazzo, head of the Moscow representation of the UBI Banca, Italy, Prince Sforza Ruspoli, vice-president of Banca del Sud, Italy, and Ms. G. Fomina, vice-president of ALFA-Bank. Participating in the meeting from the Russian Orthodox Church were Archpriest Vsevolod Chaplin, Chairman of the Synodal Department for Church-Society Relations, Archpriest Sergiy Zvonarev, DECR secretary for the far-abroad countries, and Rev. Alexy Dikarev of the DECR secretariat for inter-Christian relations. Earlier that day, Cardinal Paul Poupard attended a Russian-Italian symposium on economic ethics. Welcoming the guests, Patriarch Kirill noted that it was already the fourth symposium on business ethics to be held in Moscow since 2010. A Russian-Italian coordinating committee “Ethical Entrepreneurship” was set up in 2012, with Ms Fomina as its chair. His Holiness stated the importance of this theme, noting that the Russian Orthodox Church gives special attention to education, as rapid economic, social and political changes in Russia, Europe and the world posed before the Church a task of reforming the whole system of theological education. “We in the Russian Church are great lovers of the word “reform” because all the reforms which took place in Russia throughout her history had very complicated consequences for the life of our people. This is also true for the Church. From our bitter experience we have learnt that a reform should not include the rejection of tradition. We remember that the Marxist call to destroy the old world led to terrible consequences for our country and people. Therefore we prefer to speak of progressive development taking into account new challenges. This is how we seek now to develop our Church’s system of theological education”, he said. Patriarch Kirill also spoke about the successful efforts of the Church in Russia to make Theology included in the list of academic disciplines. Speaking about the structure of higher theological education in the Church, he mentioned the problem of financing, stressing that this burden is borne by the Church alone. “This certainly creates additional problems”, he continued, “therefore, when I learnt that you have considered a possible participation of banks in supporting the education system, my soul rejoiced. Let us hope that the impulses coming from today’s symposium will be heard and taken in by our banking community”. His Holiness also told his guests about the social work carried out by the Russian Orthodox Church by offering rehabilitation to drug addicts and alcoholics, aid to the homeless, material support to young mothers in trouble, by leading a comprehensive campaign to help reduce the number of abortions in the country. “I thank God that through these efforts many women have preserved their children”, he said. Patriarch Kirill also spoke about the Church’s cooperation with the parliament in the efforts to protect motherhood and childhood. “It presupposes a broad dialogue with political parties represented in the State Duma”, he said. The guests also heard about the Church’s work to help victims of various emergences. A number of priests have received special training for work during various emergencies, giving spiritual and psychological support to victims of natural disasters and terror acts. “We raise funds for aid. This money is given by ordinary people. We do not appeal to banks or corporations to help raise the money for aid, but still manage to collect considerable funds. It certainly helps to develop the feeling of solidarity and mutual support among people’. His Holiness expressed the conviction that the Church’s cooperation with financial institutions helps to humanize the modern business. “The moral dimension of business, therefore, is no less important than effective management technologies”, he said. Cardinal Paul Poupard, in his turn, cordially thanked His Holiness for the generous hospitality and profound reflections which define the problems of the modern society exactly. It is important to note that the Church, in addressing the secular world and the sphere of education, businessmen, etc., seeks in the first place to help the society itself to go in the right direction, he said. Businessmen should understand that, along with profit, there are such notions as responsibility and justice. Only if all the public forces, including the sphere of economics, carry out their work in a responsible way for the sake of justice, the society will be able to develop really successfully. In this context, the cardinal said, the concrete efforts of the Russian Church for protecting motherhood and childhood and the efforts of the Church’s social structures to help young mothers who stand in need but decide to preserve their children acquire special importance. Ms Fomina said that the notion of responsibility was central at the symposium, which took place at the Russian Academy of National Economy and Public Service. The organizers of the symposium set themselves the task to raise students’ awareness of the moral responsibility in business. The guests said they noticed a great interest both students and professors showed in the problems under discussion at the symposium. In conclusion of the talk, the sides agreed that the advocacy of ethical principles in the socio-economic sphere was a fruitful theme for developing broad cooperation between the Russian Orthodox Church and the Roman Catholic Church.